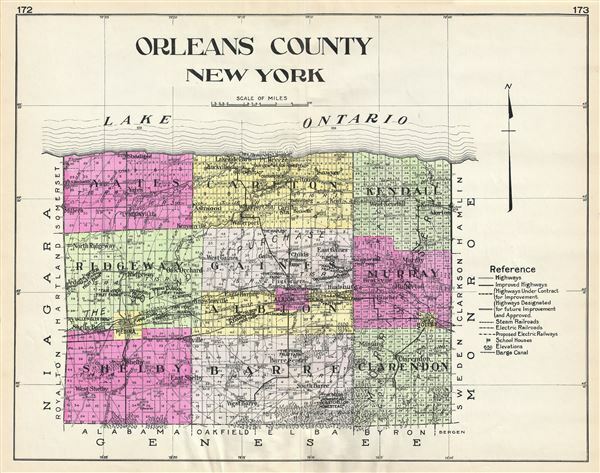 A highly appealing 1912 large format folio map of Orleans County, New York, issued for the New Century Atlas of Counties of the State of New York. The map covers the south side of Lake Ontario from Yates to Kendall, including Carlton, Ridgeway, Gaines, Murray, Albion, Shelby, Barre and Clarendon. There is appealing detail throughout with the roads, towns, and railroad lines clearly represented. Various communities are identified with larger districts highlighted in vivid pastels. This map was issued as plate nos. 172 and 173 in Everts' New Century Atlas of Counties of the State of New York. Louis Humphrey Everts (April 14, 1836 - January 26, 1924) was an American map and atlas publisher active in the late 18th and early 19th century. Self-described as a "very busy and successful man", Everts was born in East Otto, New York. His family relocated to Geneva Illinois in 1851 where he worked as a clerk. In 1860 he moved to Chicago where he worked in Potter Palmer's dry-goods establishment. Following the outbreak of the America Civil War Everts joined the Union Army accepting a commission as Second Lieutenant in Company D. In 1861 he was promoted to First Lieutenant. During the course of the Civil War Everts saw action at Shiloh and Corinth before becoming an aide-de-camp to General Pleasant Adams Hackleman. He was later promoted again to the rank of Captain serving in the Western Theater and participating in Sherman's March. He ended his military service in 1865 with the rank of Brevet Major. During the war Everts befriend trade cartographer Thomas Hinckley Thompson, also a captain. Planning military strategy revealed the notable dearth of high quality county plans. Seeing a business opportunity the two teamed up as 'Everts and Thompson' (1865 - 1872) and began publishing county maps in Chicago. After the Great Chicago Fire, Everts acquired Thompson's stock and, in his own words "made the business large and profitable until it was necessary for me to visit Philadelphia and establish an office". Everts expanded his production rapidly moving away from standalone maps and refocusing on town histories and county atlases. He worked with numerous partners and seems to have been profitable, investing widely and diversely from land speculation to insurance firms. Apparently he was not the most successful investor and was forced to declare bankruptcy in 1900. Within two years he was back at head of a new firm, the Century Map Company. Active from 1902 to 1912 the Century Map Company published twelve atlases. Everts retired in 1913 and after briefly residing in a home for retired veterans moved to 215 Green Street, Philadelphia, where he lived until his death at 87 years. New Century Atlas of Counties of the State of New York, (Everts) 1912.